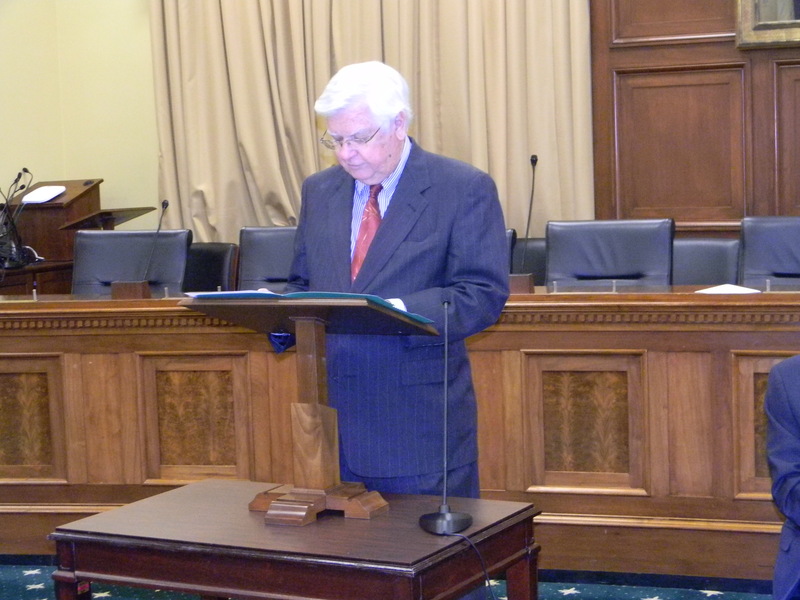 Today, Congressman Harold “Hal” Rogers (KY-05) participated in a Capitol Hill briefing focused on the role of Prescription Drug Monitoring Programs (PDMP) in combating the illegal trafficking and abuse of prescription painkillers. Sponsored by The Pew Health Group, experts from the PDMP Center of Excellence at Brandeis University’s Heller School for Social Policy and Management presented highlights from a new white paper that examines the effectiveness of state PDMP’s and puts forward a set of best practices that all U.S. states and territories can use to improve their effectiveness. These results were shared at the September 20th press briefing in Washington, DC. Joining the briefing, Karen Kelly of Operation UNITE was on hand to share perspectives on the local fight against prescription drug abuse. “When prescription drug abuse took hold of my rural congressional district more than a decade ago, we were unprepared for the problem,” said Rogers. “However, our state-run prescription drug monitoring program, KASPER, has provided a vital resource for doctors to practice good medicine and for law enforcement to weed out bad actors. Now that almost every state has a PDMP, we need to maximize their efficiencies and link them together. I hope that these results shared today encourage every state and community to make prescription drug monitoring programs a priority." Photo Cutline: Congressman Rogers speaks on the role of Prescription Drug Monitoring Programs (PDMPs) in combating the illegal trafficking and abuse of prescription painkillers. Rogers has been a leader in Congress in combating the abuse of prescription drugs for more than a decade. In 2002, Rogers established a grant program in the U.S. Department of Justice to support states’ adoption of PDMPs. Since that time, the number of states with authorized PDMPs has tripled from 15 to 49. In addition, this summer, a landmark agreement was reached to facilitate the secure exchange of prescription data among state PDMPs. - States that collected prescribing data for all controlled substances (e.g., anti-anxiety medication as well as painkillers) reported lower rates of doctor-shopping (visiting multiple doctors to obtain prescriptions) than other states. - The rates of fatal painkiller overdoses grew more slowly in three states using state-issued prescription forms with uniquely configured page numbers, a practice designed to curb fraud. - Proactively sending alerts about possible abuse to physicians and pharmacists was associated with decreased prescription sales and lower rates of doctor-shopping. - Analyzing trend data helped law enforcement agencies identify “pill mills” that were illicitly distributing prescription painkillers. - Boosting doctors’ participation in and utilization of prescription drug monitoring programs was associated with reduced fatal prescription painkiller overdoses. The Pew Health Group, a division of The Pew Charitable Trusts, provided funding for the research. The Pew Health Group conducts research to form pragmatic policies that prevent unnecessary health risks. It is part of The Pew Charitable Trusts, a nonprofit organization that applies a rigorous, analytical approach to improve public policy, inform the public and stimulate civic life. More information is available at www.PewHealth.org.